We started our trip to South Africa in Johannesburg and gave ourselves a couple days to explore the city and its surroundings before embarking on a wilder adventure in South Africa's game parks. South Africa struggled for years under apartheid, the strict segregation of blacks and whites and legalized discrimination against the non-white majority. It was only in 1991 that apartheid was abolished, Nelson Mandela was released from prison and he went on to become the first black president of South Africa in 1994. We felt that it was important not to gloss over this difficult history and signed up for a day trip to Soweto, a poor township on the outskirts of Johannesburg. Soweto (short for Southwest Townships) was a hot bed of protest and unrest during the fight to overturn the racist policies of the national government under apartheid. Many Africans were forcibly removed from their homes and relocated to remote townships such as this. Today, Soweto is a peaceful, predominantly black community. Soweto is also home to South Africa's Apartheid Museum and gives an in depth view of what life was like here between 1948 and 1991. I like reading books about the history of the places I visit or that tell a story in the context of history. I highly recommend Nelson Mandela's autobiography (Long Walk to Freedom) and The Native Commissioner by Shaun Johnson, a work of fiction that takes place during apartheid. When most people think of a safari trip, they think of visitors clinging to the back of a jeep or range rover with the top down and binoculars poised. That is indeed how it works when you go in search of the Big 5 in South Africa. Simbambili also offered guided bush walks after breakfast each day. An armed ranger would take us out (being careful to avoid areas with recent sightings or evidence of large predators). We got to inspect tracks and even dig into some dried elephant dung! South Africa may be known for land-based wildlife and safaris but don't underestimate the wildlife watching opportunities along the coast. We drove from Cape Town to Hermanus, a town where you can frequently see whales without getting on a boat. Hermanus even has a Whale Crier who rings a bell and shouts in an old-fashioned "hear ye! hear ye!" kind of way. With a little help from the Whale Crier, we spotted a number of magnificent southern right whales spouting off. We also enjoyed walking on the trails winding through the rocky seacliffs and beaches of Hermanus. The rocks were covered with rock hyraxes (or dassies as the locals call them). Betty's Bay is a short 45 minute drive from Hermanus. For a small fee (about 20 rand at the time we visited), we were admitted to a boardwalk that coursed through a large colony of African penguins (also known as jackass penguins due to the sounds they make). We could have stood there for hours watching the penguins waddle about to attend to their daily business. Boulders Beach along the Cape of Good Hope is the more famous penguin colony, but we really liked Betty's Bay. There were a ton of penguins, the coastline was incredibly scenic, and it was much less crowded than Boulders Beach. Cheetahs are very endangered and thus rare to see in the wild in South Africa. We opted to visit the Cheetah Outreach Sanctuary which is situated near Cape Town. For 140 rand, you can arrange for an encounter with an ambassador cat. The proceeds go toward conservation and the upkeep of the sanctuary. Getting close to these magnificent creatures is definitely a once-in-a-lifetime experience. Franschhoek may be most widely known for wine but we were also amazed at the quality of South Africa's cuisine here and generally across the country. We dined al fresco with views of the vineyard at Fyndraai restaurant at Solms Delta winery. A three-course gourmet meal in this spectacular setting was just 145 Rand (about $15 USD at the time of our trip). When visiting South Africa's iconic Stellenboach wine region, make sure to stop in to Van Ryn's Brandy Distillery. We sampled fine brandy along with coffee and chocolate. The coffee was the perfect touch especially since we visited first thing in the morning. Our motto: it's happy hour somewhere! Sit back and sink into a fine leather chair and swirl away. Kirstenbosch National Botanical Garden in Cape Town is an idyllic spot for a hike. We spotted a gorgeous Malachite Sunbird sitting atop a King Protea, South Africa's national flower. The views and scenery are simply stunning and the gardens should not be missed for a quiet hike and a bit of birdwatching. If you plan to spend more time exploring Cape Town in depth, I recommend checking out this Cape Town travel guide on the Soul Drifters blog. From Cape Town, a day trip to the Cape of Good Hope is an easy diversion. We signed up for a Daytrippers tour of the Cape of Good Hope which included a 6 km optional bicycle ride. It's worth getting out of the van and pumping the pedals with the wind against your face and amazing scenery on both sides of the nearly deserted road. The Cape of Good Hope, the most south-western point in Africa has great views of the roiling sea. The Cape marks the point where a ship begins to travel more eastward than southward and early explorers approached the treacherous journey with trepidation. Also known as the Cape of Storms, I could just imagine why this was a pivotal point in the journey for any ship headed east in search of spices. 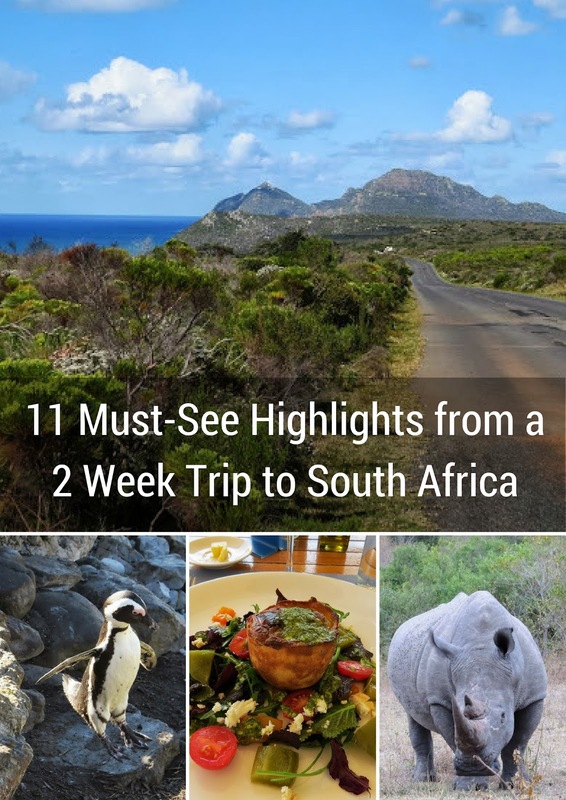 As you can see, South Africa offers a tremendous variety of experiences to easily fill a two-week trip. From history, to amazing food and wine, to awe-inspiring nature and wildlife, South Africa is a destination that should be your bucket list. For more on the destinations we visited, check out our handy map below. Find out about things not to miss in South Africa in 2 weeks. Enjoy two weeks in South Africa with stops in Johannesburg, Soweto, Kruger National Park, Cape Town and the surrounding wine regions.